Remember that scene from Dirty Dancing when Patrick Swayze and Jennifer Grey practice their lifts in a lake? Turns out they weren't the only ones in the water; choreographer Kenny Ortega was right there beside them. 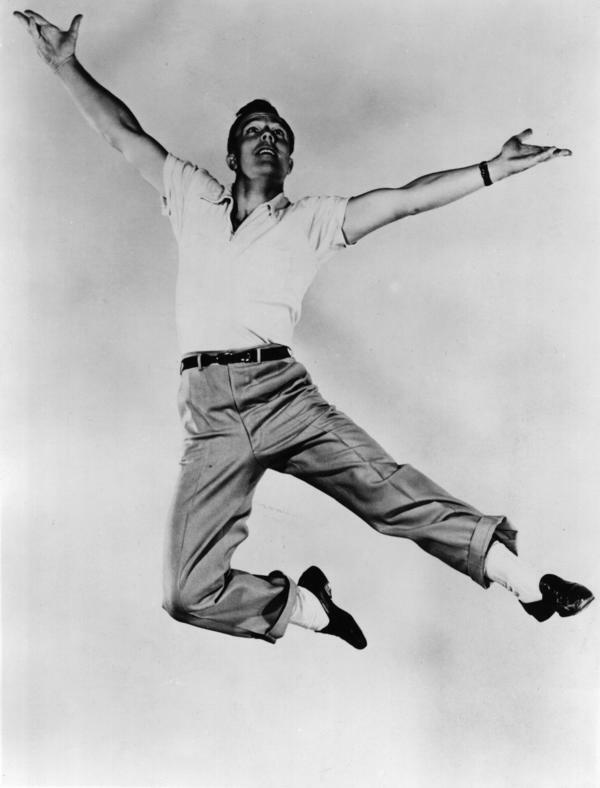 Ortega's dance education began in his living room, where he watched Gene Kelly movies as a child. Ortega later got the opportunity to direct Kelly in the 1980 film Xanadu. Dancer, actor, singer and director Gene Kelly was — many decades after this photo was taken — a mentor to Ortega. "He would invite me to his home," Ortega recalls. "We would look at his films together and he would talk to me about how he designed choreography for camera." 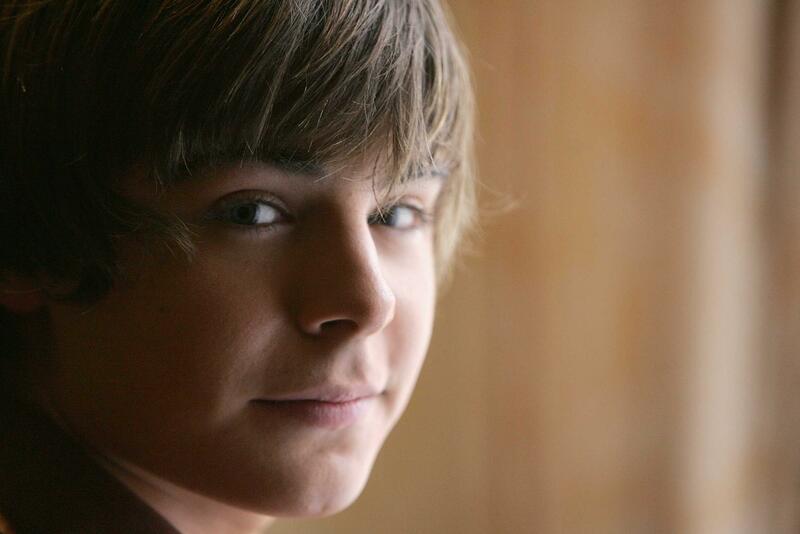 Zac Efron, pictured above attending an event for the cast of High School Musical in 2005, was in his teens when he was cast in the Disney film. He says working with Ortega gave him confidence as a young actor. 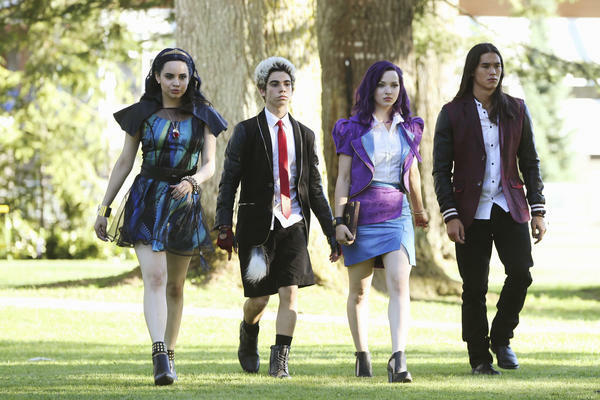 Sofia Carson (from left), Cameron Boyce, Dove Cameron and Booboo Stewart star as the next generation of Disney villains in Descendants. What do Michael Jackson, Zac Efron, Bette Midler and Patrick Swayze have in common? They've all worked closely with choreographer Kenny Ortega — a veteran song and dance man who has inspired generations of performers. On July 31, the Disney Channel premieres his new movie Descendants, starring a number of young, new actors as well as veterans like Kristin Chenoweth and Kathy Najimy. Ortega designed big concerts for Michael Jackson, auditioning dancers and overseeing the crew. He was working on Jackson's final tour before the singer died in 2009. Ortega choreographed the smash hit Dirty Dancing and directed all three of Disney's "High School Musical" films. But Ortega's career really began in his childhood living room in California, where, mesmerized by Gene Kelly movies, he tried to follow all the star's steps. "He said 'If I were to dance — and I'm not saying I'm going to dance — but if I were going to dance, what would you have me do?' And so I just said, 'Well, why don't we just start with some of the steps that you've already done which, to me are, you know, classic and timeless.' And I got up and started doing some of his moves and he said 'Oh, that's the old Nora Bayes,' and 'That's not right, it's this way' and suddenly we were dancing." Ortega may have directed Kelly in those dance numbers in Xanadu, but it was Ortega who got an education. "He mentored me, and when the movie was over he continued to," Ortega recalls. "He would invite me to his home and we would look at his films together and he would talk to me about how he designed choreography for the camera which was the greatest education I had received up until that point." One bit of movie trivia many Dirty Dancing fans may not be aware of: That lake was frigid. In fact, Ortega says Grey ended up going to the hospital for hypothermia. "You'd never know it from the glee and the smile on her face, but in fact it was not an easy scene to shoot," says Eleanor Bergstein, who wrote and co-produced Dirty Dancing. But the cold water didn't deter Ortega; Bergstein remembers the choreographer got in the lake with Swayze and Grey. "He got in the water with them," she says. "He was terrific." The movie is based on Bergstein's own experiences — dancing with her friends in basements in Brooklyn, just like you see in the movie. Turns out, Ortega had danced some of those same, evocative steps himself in California. "Street salsa, Colombian style salsa, Cuban rhythm step, R&B and street soul," he remembers, "we were drawing from a number of different places to ultimately arrive at what Dirty Dancing became." The movie was made on a shoestring budget. It was cold and rainy on location and Bergstein says none of the studio executives really believed in it. But she says Ortega was always upbeat with the cast and took every aspect of the filming seriously. "He went over everything with me," Bergstein says. "You know, 'Did Baby dance on her father's feet when she was a little girl?' We went over all the basic subtext of how I wanted everybody to move in it because he wanted to know everything." Ortega is the ultimate musical theater guy. He was in a professional, stage production of Oliver when he was a teenager and he starred in a touring production of Hair. So it was a no-brainer when he was offered the opportunity to direct a story about the making of a high school musical. For a certain demographic, High School Musical is Disney's most popular property. Teenagers around the globe saw it, bought the soundtracks, the T-shirts and more. The trilogy launched the careers of Vanessa Hudgens, Ashley Tisdale and Zac Efron. He was just a teen — and still pretty green — when he met Ortega and says it was a gift for him and for the other young cast members to work with the veteran choreographer. "What he did with his aura and positivity and reinforcement — he was able to bring out something special," he says. "I can definitely say for a fact that I witnessed him speaking one-on-one with every person in the cast and uplifting them." Ortega's ability to nurture future stars and create films that teens around the world want to see has meant gold for Disney. They're hoping he's done it again with Descendants, a film premiering next Friday on Disney Channel. It's a musical fantasy about the teenage offspring of some of Disney's most famous villains. Ortega says he thinks he's found young actors who could become every bit as successful as Efron or Tisdale, and says he approached casting for Descendants the same way he approached casting for that first High School Musical. "When you cast you want to make sure these kids are coming fully loaded," Ortega says, "because you have three weeks' rehearsal — which is not a long time — so you want to make sure you have collaborators and partners in these young people — kids that are easily going to be guided and steered and inspired." So many years ago, Kenny Ortega's mentor Gene Kelly might have said the same thing about him. Next, we'll profile an influential song and dance man. Even if you've never heard of him, you have likely seen the results of his work because choreographer Kenny Ortega has worked closely with the likes of Bette Midler, Patrick Swayze and Michael Jackson. Next week, Disney Channel premieres his new movie, "Descendants." It stars a number of young new actors as well as veterans. Here's NPR's Elizabeth Blair. ELIZABETH BLAIR, BYLINE: Where do you begin to tell the story of Kenny Ortega? You could start with Michael Jackson. MICHAEL JACKSON: (Singing) If you can't feed your baby, don't have a baby. BLAIR: Ortega designed big concerts for Jackson, auditioning dancers, overseeing the crew. He was working on Jackson's final tour before the singer died. Here's Ortega in a video about the making of that tour. KENNY ORTEGA: The dancers in a Michael Jackson show are an extension of Michael Jackson. 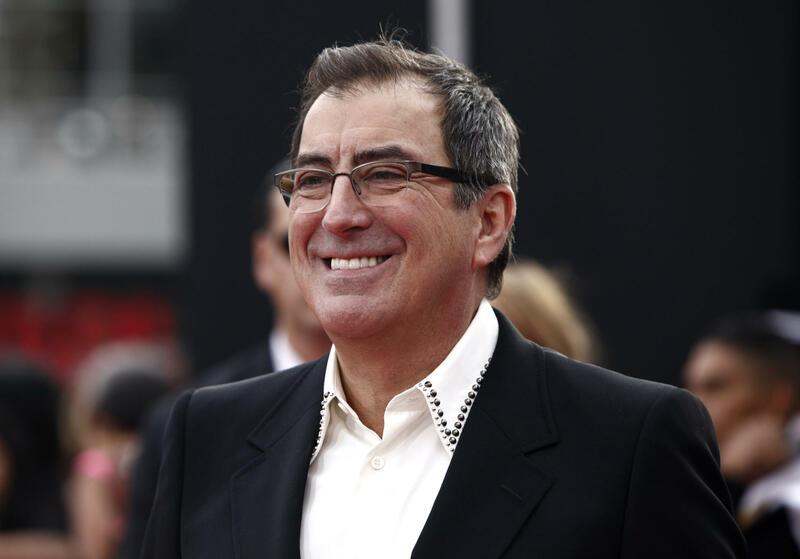 BLAIR: Kenny Ortega choreographed the smash hit "Dirty Dancing." BILL MEDLEY AND JENNIFER WARNES: (Singing) Because I had the time of my life. BLAIR: And directed all three of Disney's "High School Musical" films. HIGH SCHOOL MUSICAL CAST: (Singing) We're all in this together, once we know that we are, we're all stars and we see that. BLAIR: But really, Kenny Ortega's story begins in his childhood living room in California watching Gene Kelly movies. GENE KELLY: (Singing) I'm singing in the rain, just singing in the rain. BLAIR: Mesmerized by his dancing, Ortega tried learning his steps. ORTEGA: He would do chasse, crossover, chasse, crossover. He would do these pull backs. And the way that he would say, atta, atta, atta, atta, aticka-ta-ticka-ticka-tatta (ph). (Laughter). BLAIR: Years later, Kenny Ortega not only met his idol; he got to direct him in the 1980 movie "Xanadu." BLAIR: It flopped, trashed by the critics. But you'd never know it to hear Ortega talk about it. Before Gene Kelly signed on, he wanted to meet the choreographer. ORTEGA: I have to tell you, in that meeting he said, you know, if I were to dance - and I'm not saying that I'm going to dance - but if I were going to dance, what would you have me do? And so I just said, well, why don't we just start with some of the steps that you've already done, which to me are, you know, classic and timeless. And I got up and started doing some of his moves. And he said, oh, that's the old Nora Bayes, and no, that's not right; it's this way. And suddenly, we were dancing. BLAIR: Ortega may have directed Kelly in those dance numbers in "Xanadu," but it was Ortega who got an education. ORTEGA: He mentored me. And when the movie was over, he continued to. And he would invite me to his home. And we would look at his films together. And he would talk to me about, you know, how he designed choreography for camera, which was the greatest education that I had received up until that point. BLAIR: Gene Kelly inspired Ortega to experiment with choreography, to play with space and levels and water. PATRICK SWAYZE: (As Johnny Castle) Bend your knees. And go. SWAYZE: (As Johnny Castle) Good. BLAIR: "Dirty Dancing" fans will remember the scene in the lake, when Patrick Swayze is teaching Jennifer Grey the lift. SWAYZE: (As Johnny Castle) Good, don't break. Don't break. JENNIFER GREY: (As Frances Houseman, screaming). BLAIR: Here's a little movie trivia for you. That lake was frigid. Ortega says Jennifer Grey got hypothermia and had to go to the hospital. ORTEGA: You'd never know it from the glee and the smile on her face. But in fact, it was, you know, not an easy scene to shoot. BLAIR: Eleanor Bergstein wrote and co-produced "Dirty Dancing." ELEANOR BERGSTEIN: And Kenny got in there with them. He was great. BLAIR: He got in the water? BERGSTEIN: He got in the water with them. He was terrific. BLAIR: The movie is based on Bergstein's own experiences dancing with her friends in basements in Brooklyn, just like you see in the movie. BLAIR: Turns out Ortega had danced some of those same sexually evocative steps himself all the way in California. ORTEGA: Street salsa, Colombian-style salsa, Cuban rhythm step, R&B and street soul, we were drawing from a number of different places to ultimately arrive at what "Dirty Dancing" became. BLAIR: "Dirty Dancing" was made on a shoestring. It was cold and rainy on location. Eleanor Bergstein says none of the studio executives really believed in the movie. But she says Ortega was always upbeat with the cast and took every aspect of the filming seriously. BERGSTEIN: And he went over everything with me. You know, did Baby dance on her father's feet when she was a little girl? We went over it - all the basic subtext of how I wanted everybody to move in it 'cause he wanted to know everything. BLAIR: Kenny Ortega is the ultimate musical theater guy. He was in a professional stage production of "Oliver" when he was a teenager. He starred in a touring production of "Hair." So it was a no-brainer when he was offered the opportunity to direct a story about the making of a high school musical. HIGH SCHOOL MUSICAL CAST: (Singing) What time is it? Summer time. It's our vacation. What time is it? Party time. That's right, say it loud. BLAIR: For a certain demographic, "High School Musical" is Disney's most popular property. Teenagers around the globe saw it, bought the soundtracks, the T-shirts and more. The trilogy launched the careers of Vanessa Hudgens, Ashley Tisdale and Zac Efron. ZAC EFRON: Kenny's the kind of mentor and sort of friend that never shows any limits. He never lets you know your limits. BLAIR: They were also teenagers who were pretty green. Efron says meeting Ortega was a gift. EFRON: What he did is just sort of with his aura and with his energy, with his positivity and sort of his reinforcement, he was able to bring out something special. And I can definitely say for a fact that I witnessed him speaking one-on-one with every single person in the cast and overheard him uplifting them. BLAIR: Ortega's ability to nurture future stars and create films that teens around the world want to see has meant gold for Disney. They're hoping he's done it again with "Descendants." It's a musical fantasy about the teenage offspring of some of Disney's most famous villains. UNIDENTIFIED ACTOR: (As character) (Singing) I'm rotten to the core, core, rotten to the core. I'm rotten to the core, core. Who could ask for more? BLAIR: Ortega says he's thinks he's found young actors who could become every bit as successful as Zac Efron or Ashley Tisdale. He says he approached casting for "Descendants" the same way he approached casting for that first "High School Musical." ORTEGA: When you cast, you want to make sure that these kids are coming fully loaded because you get about three weeks rehearsal, which is not a long time. So you want to make sure you have collaborators and partners in these young people, kids that are easily going to be sort of guided and steered and hopefully inspired. BLAIR: So many years ago, Kenny Ortega's mentor, Gene Kelly, might have said the same thing about him. Elizabeth Blair, NPR News. Transcript provided by NPR, Copyright NPR.